Start 1. Certification. 2. Log in to View Your Key. About You. Listener. Contact. Register. Other Wise Come On In. Congratulations! 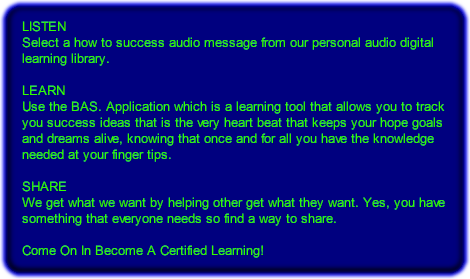 Create Your Own Personal Audio Digital Learning Library. © 2016 - www.basuccess.org developer.